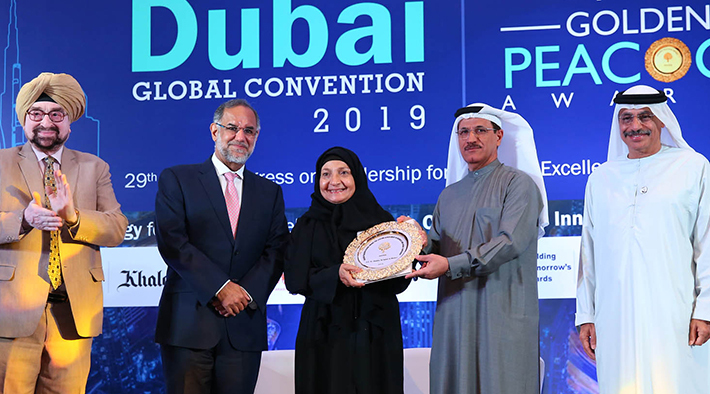 Her Excellency Dr. Shaikha AI Maskari started her career with her family Group, Tricon Energy Operations and established the well known AI Maskari Holding (AMH) in 2008. A brilliant scholar, she earned her BA atthe University of London and PhD at Indiana University, U.S.A.
She founded the Global Institutes of Paramedic Justice & Technology and Rescue Academy, for Corporate Social Responsibility, both have trained hundreds of UAE personnel in advanced police sciences, emergency medical services. In 1993, she set up her family charity, United Mercy Foundation, which sponsors orphans and orphanages and provides food, medical, and emergency relief in the Middle East, Africa and Asia. She was recognized by Forbes Middle East (2015) amongst the 100 Most Powerful Arab Business Women, by the Federation of GCC Chambers of Commerce & Industry with "Award For Excellence In Leadership"; by Enterprise Asia the "2016 AsiaPacific Woman Entrepreneur of the Year"; for "Making outstanding contribution to enhancing Australia-UAE Relations"; by Global Thinkers Forum: "Excellence In Business 2014"; and the King of Sweden has bestowed upon Her Excellency the 'Order of the Polar Star', 1"t Class. She serves on several Boards of non-profit organizations like Arab International Women's Forum (AIWF), Women For Sustainable Growth (W4SG), International Cooperation Platform (lCP), Enterprise Asia, and Advisory Board member of Abu Dhabi Music & Arts Foundation (ADMAF).